In the not so distant future, “Data Bank” companies consisting of Subject Matter Experts (SME) across all verticals, may process your data feeds collected from your purchase and user behavior profiles. Consumers will be encouraged to submit their data profiles into a Data Bank who will offer incentives such as a reduction of insurance premiums to cash back rewards. Everything from activity trackers, home automation, to vehicular automation data may be captured and aggregated. The data collected can then be sliced and diced to provide macro and micro views of the information. On the abstract, macro level the information may allow for demographic, statistical correlations, which may contribute to corporate strategy. On a granular view, the data will provide “data banks” the opportunity to sift through data to perform analysis and correlations that lead to actionable information. ‘Universes’ (i.e. Business Objects) of data that may be ‘mined’ by consumer approved, ‘trusted’ third party companies, e.g. your insurance companies. Actionable information based on AI subject matter rules engines and consumer rule transparency may be provided. “Data Banks” may be required to report to their customers who agreed to sell their data examples of specific rows of the data, which was sold on a “Data Market”. Targeted, affordable, medicine that may redirect the choice of the doctor to an alternate. The MD would be contacted to validate the alternate. The curriated data collected may be harnessed by thousands of affinity groups to offer very discrete products and services. Purchase and User Behavior Profiles, correlated information stretches beyond any consumer relationship experienced today. At some point, health insurance companies may require you to wear a tracker to increase or slash premiums. Auto Insurance companies may offer discounts for access to car smart data to make sure suggested maintenance guidelines for service are met. 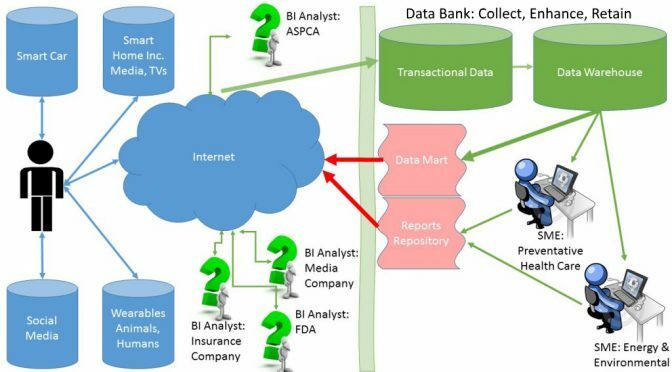 You may approve your “data bank” to give access to specific soliciting government agencies or private firms looking to analyze data for their studies. You may qualify based on the demographic, abstracted data points collected for incentives provided may be tax credits, or paying studies. [US] tax coupons to enable the buyer, at the time of purchase, to save money. For example, a 100 USD discount applied at the time of purchase of an Activity Tracker, with the stipulation that you may agree, at some point, to participate in a study. Government subsidies: the cost of aggregating and archiving Purchase and Behavioral profiles through annual tax deductions. Today, tax incentives may allow you to purchase an IoT device if the cost is an itemized medical tax deduction, such as an Activity Tracker that monitors your heart rate, if your medical condition requires it. Affinity branded IoT devices, such as American Lung Association may sell a logo branded Activity Tracker. People may sponsor the owner of the tracking pedometer to raise funds for the cause. Initiatives such as General Data Protection Regulation (GDPR) and other privacy initiatives which seek to constrict access to your data to you as the “owner”, as a byproduct, create opportunities for you to sell your data. As a consumer of goods and services, a Purchase Profile is established and evolves over time. Online purchases are automatically collected, curated, appended with metadata, and stored in a data vault [Blockchain]. “Offline” purchases at some point, may become a hybrid [on/off] line purchase, with advances in traditional monetary exchanges, and would follow the online transaction model. User Behavior (UB) profiles, both on and offline will be collected and stored for analytical purposes. A user behavior “session” is a use case of activity where YOU are the prime actor. Each session would create a single UB transaction and are also stored in a “Data Vault”. UB use cases may not lead to any purchases. Not all Purchase and User Behavior profiles are created equal. Eg. One person’s profile may show a monthly spend higher than another. The consumer who purchases more may be entitled to more benefits. These datasets wholly owned by the consumer, are safely stored, propagated, and immutable with a solution such as with a Blockchain general ledger.